Hol and I went out for a walk after dinner. I stated that I was determined to hear a thrush. Their haunting, piercing song is a crucial rite of spring for me. I have been away from home for a while, so missed their return. I heard one at a distance the other evening, but tonight we not only heard a hermit thrush in ear-thrilling proximity, we could see it! In this video, if you go to full-screen mode, you can see the bird move from one branch to another near the middle of the frame. Thrushes are very private, secretive birds. (Not unlike my recently departed mother.) I’ve seen one before very briefly. But mostly they are invisible in the dusky forest. Every year I drag out this bit of Gerard Manley Hopkins’ poem Spring…but every year it is true. 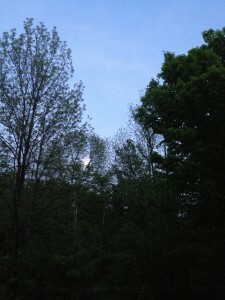 And here is the almost-full May moon rising after we got home from our bird walk. Here is a video about the moon, thrushes, and veeries, that I made 6 years ago. The meadow where I filmed the moon is now fully grown up with pine trees. The passage of time is nearly unbearable. I was working at the computer this evening, past the cat’s feeding time. She was sitting right in front of my screen and following my cursor around, occasionally reaching up to bat at it. It occurred to me that she might enjoy watching something more exciting, so I went to YouTube and searched for “videos for cats.” I didn’t know there was such a thing, but of course there is. This example popped up, and I started playing it. She knows the squirrels aren’t real, but she’s not quite sure what to do with them. She does a little investigating toward the end. Yesterday at dusk I caught this owl spying on me through the window. She was back this afternoon. Take a handful of semisolid hogfat. Mix in some of that banana granola that wasn’t very good. Stick it in the birdfeeder, and presto! Hours of fun for all concerned. Here’s a little movie I made the other day. I had smelled something terrible the previous night, which I traced to a skiboot on my basement stairs. Tucked inside it was a dead chipmunk. I dumped the sad little thing into the weeds, but Holly suggested that a much more respectful and practical solution would be to compost it. So I did. Warning–contains footage of cute dead rodent. Also, I just got a phone call from my friend Ruth. She was at the gym this morning, watching CNN. They were showing footage from a Christian Broadcast Network report on the gay marriages happening in Iowa today. For a second, she saw me and my ex Amy Rubin on the screen, getting married on the steps of City Hall in San Francisco five years ago. The Christian Broadcast Network? What were they doing at my wedding? It reminded me of this panel from a cartoon I once did about lesbian-specific phobias. Since the chipmunk incident, I have put a collar with three bells on the cat. So far this has stemmed the tide of wildlife that had been flowing into the house. Yesterday I had to drive 10 hours from Vermont to Western PA, where I’m doing a school visit at Clarion University. It’s always miraculous traveling south at this time of year because you can watch the grass getting greener and the trees unfurling as you go. Here’s my trip, from the Green Mountains, to the Adirondacks, to the Catskills, then at dusk I plunge off the edge of New York down into the Delaware River Valley, Pennsylvania and the Poconos. Around Scranton the sun set and I had to stop taking pictures. Thank you all so much for the magnificent digressions on the last post. Sorry I kinda disappeared. I’ve been working on a review for the New York Times Book Review–a graphic review of a regular book! I’m not sure when it’s coming out, but I’ll keep you posted. And I just took a short road trip to Colby College in Maine, about which I was compelled to create this little slide show for you.